Staying in a Riad is like stepping into a hidden oasis. Riads are typical accommodation in Marrakech, and are often tucked away from the bustling streets of the town. 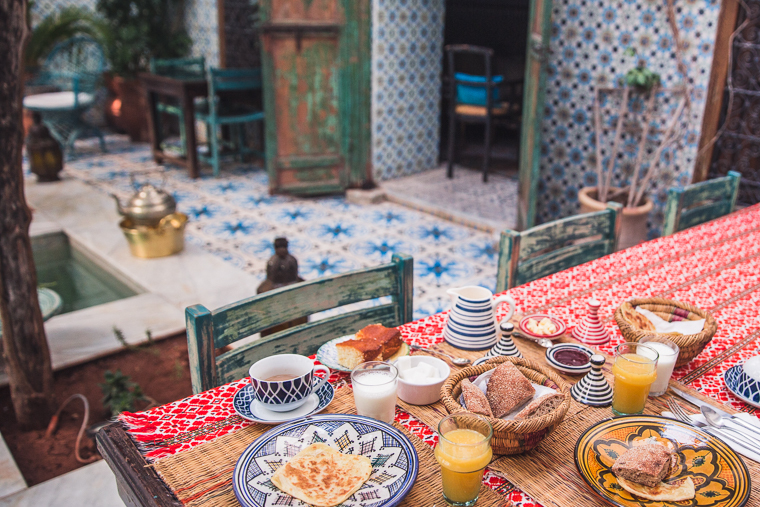 We stayed at Riad Yamina, where I started my mornings with a traditional Moroccan breakfast while planning out the day. 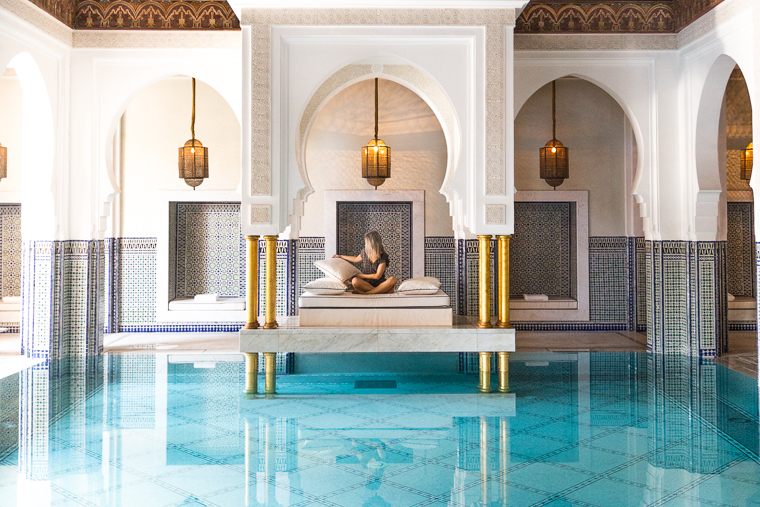 To experience Moroccan architecture at its finest, I recommend visiting Hotel Mamounia, a palace-hotel that dates back to the 12th century and has hosted the likes of Yves Saint-Laurent and Ray Charles. I could spend hours wandering the gardens of this incredible property. Dress appropriately (no shorts or sandals) and get lost here. Next to Hotel Mamounia is the Koutoubia Mosque, the largest mosque in Marrakech. It’s perfect for a quick visit to admire the architecture of the tower and its surroundings. Note: you can only step foot inside if you are Muslim. I suggest wandering through Jamaâ el Fnaa square mid-day. It hosts food stalls, snake charmers, street vendors, and much more. I treated myself to an orange juice here and it was the best I’ve ever had! Getting hungry? 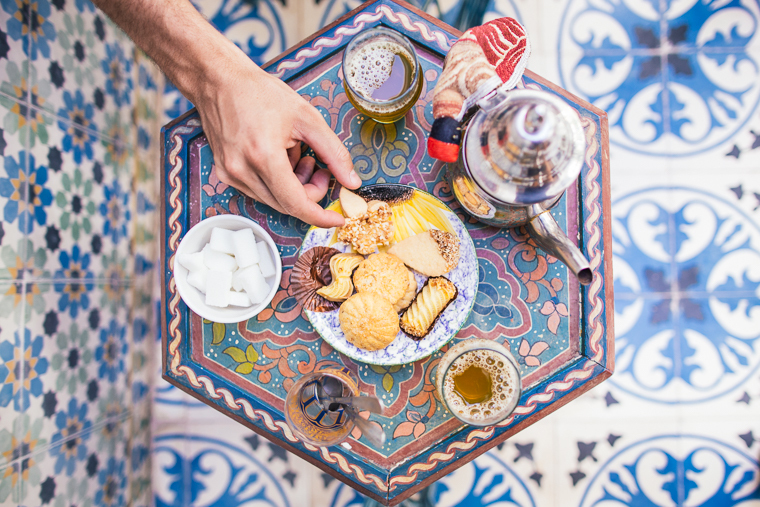 Make your way through the souks en route to Café Zaza, which serves traditional Moroccan food and has an excellent rooftop view in the heart of the Medina. After filling up, I suggest paying a visit to Ben Youssef Madrasa, an old college dating back to the 14th century with some of the most beautiful tile work I’ve ever seen. You’ll feel like you are stepping back in time wandering through the grounds. 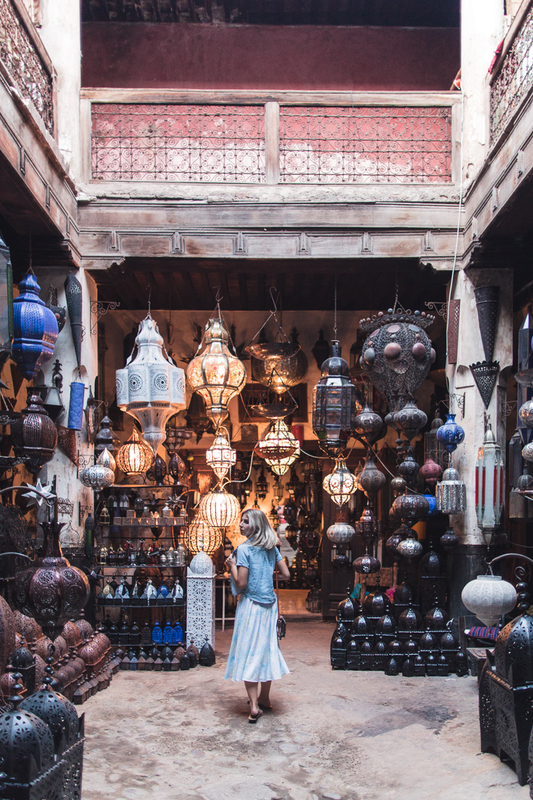 Visiting the souks is an experience in itself, and is not to be missed! There are gems to be found in these busy markets. Take home a traditional Moroccan wedding blanket or some hand-painted bowls – but don’t forget to haggle. I typically paid 1/3 of the price that was originally given for anything we bought. If you haven’t wandered the streets enough yet, this is an ideal time. Getting lost here is inevitable, but there’s something to see around every corner! You could also grab a pre-dinner drink from the bar at Nomad Restaurant and watch the sunset over the pink rooftops. Enjoy a leisurely dinner and tasty Moroccan cooking at Naranj. It’s a new restaurant not far from the square which features Moroccan food with a Lebanese spin, and beautiful interior design. 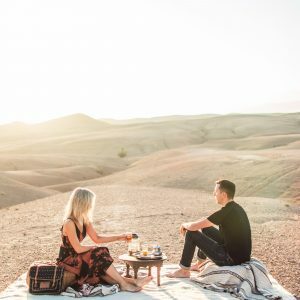 If you’re spending more than one day near Marrakech, I highly recommend checking out our overnight glamping trip in the Moroccan desert for inspiration on stays outside the city. 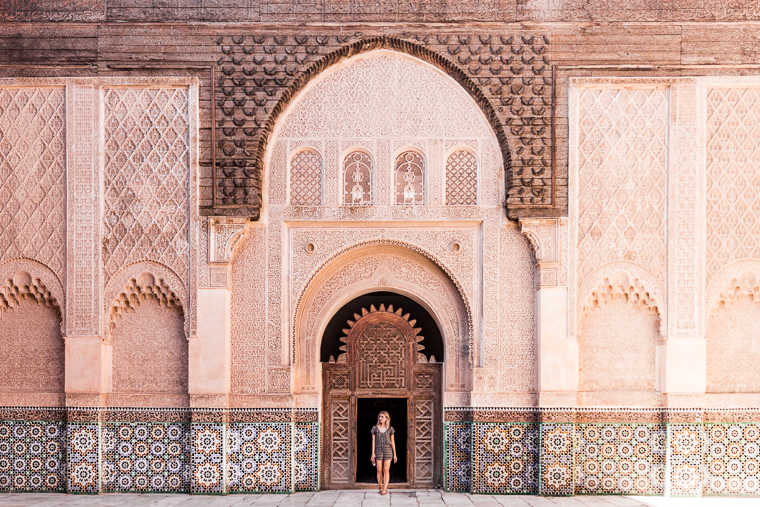 Is Morocco on your list? Let us know in the comments below! Looks amazing 🙂 Morocco have not been on my list but now I think it actually should be, looks great! It recently moved to the top of mine and I’m so glad we went! The whole country is fascinating. This is the most perfect guide! I’m planning a trip (hopefully) for next year, so am saving this for later 🙂 Thanks for sharing! I am staying at Riad Yamina this December. I can’t wait to visit the restaurants you suggested. We had 3 days in Marrakech, but I could’ve done more! 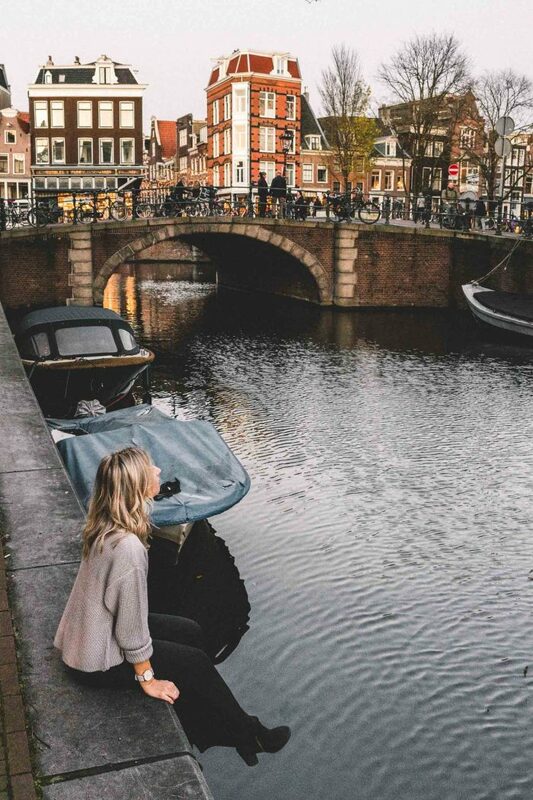 It depends on what you are looking for, but the city can be exhausting so you could definitely plan only a day or two if you want to keep it short. 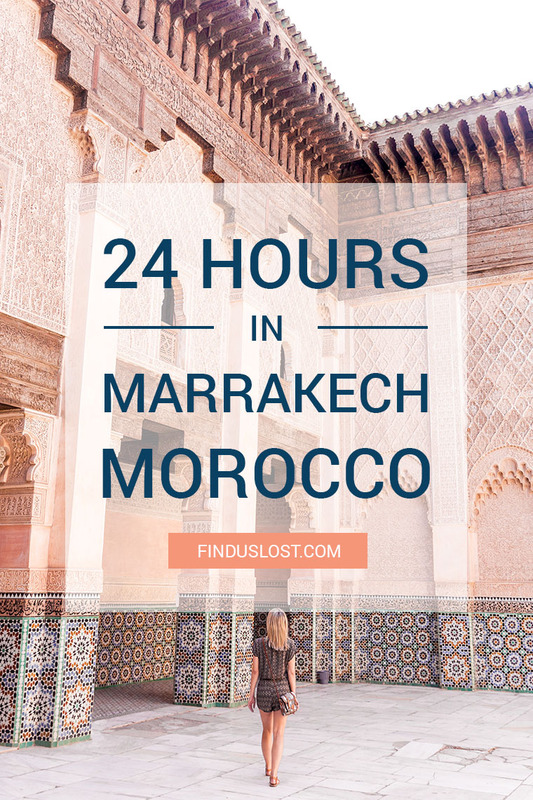 My gosh, Marrakech was on our bucket list but it’s on top now! Love your photos!! Beautifull pictures girl! I love it! I want to travel also to Marrakech! It’s definitely worth planning a trip around! Thanks Selena! Such a great guide. Very helpful for our upcoming trip for New Year’s. Thank you Morgan. Enjoy Marrakech! Thank you for this great guide! Heading there in March! Just wondering how you two got around; walk or taxis? Also, for hotel Mamounia, were you allowed to tour the hotel, including pool area or did u go for a spa treatment? Thanks!! Hi Haydee! In Marrakech we mostly walked, but would grab a taxi if we wanted to go further outside the main part of the city. I’d definitely recommend downloading an offline map via google maps for Marrakech – there are a lot of winding streets, and this will let you figure out where you are without using data! For Hotel Mamounia, we just went in the morning (no treatment booked). As long as you are dressed appropriately (no bare legs, no sandals) they will let you in. We said we were just grabbing something to eat. A lot of people also take pictures inside, so we just asked if we could see certain rooms and they allowed us to. Have a great time, Marrakech is pretty incredible! You have an incredible blog! I am so so so impressed! I will definitely continue to follow you throughout your travels and life in general. Hi! I love your blog and recommendations!! I’m thinking about traveling to Morroco in the beginning of April. How safe did you feel while you were there? How were the taxis? Did you travel at all at night? Hi Meagan! I felt perfectly safe while there. Marrakech is generally busy so you never find yourself walking the streets alone. I was also comfortable in the other cities we visited (Rabat, Ifran). 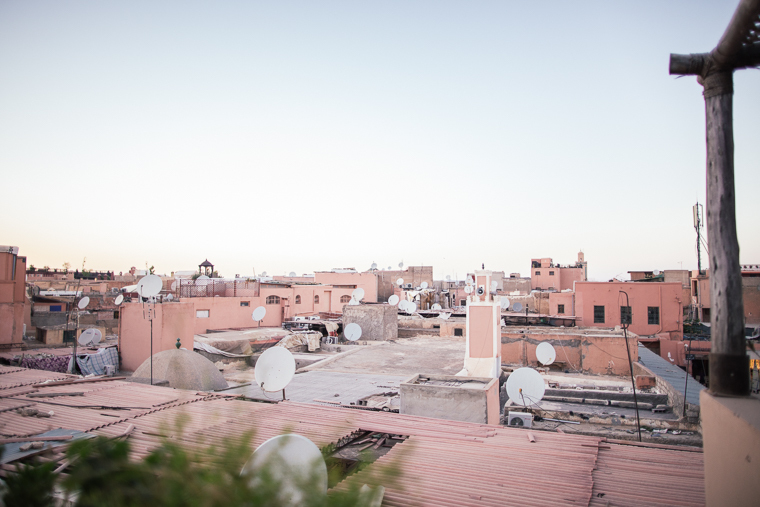 We took cars in the daytime – I’ve heard mixed reviews about taking buses in Morocco. I’m not sure I’d recommend traveling at night – you never know if you’ll run into car trouble if the roads aren’t as maintained, and you don’t want to end up in a situation like that after dark. As for the taxis, I’d recommend doing your research up front on distance so you don’t get ripped off on prices (and download Google Maps in the areas you are staying in, so you can point out a destination if there’s a language barrier!). Hi! 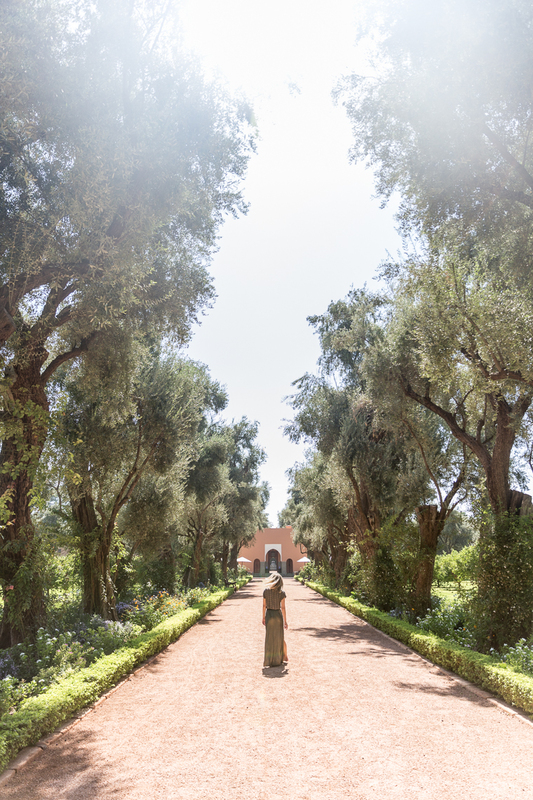 Thanks for sharing such a lovely overview of your time in Marrakech. My boyfriend and I are planning a trip there for my birthday and we were actually looking into booking a stay at Riad Yamina (I found your blog while researching that Riad). I’m just curious to know how your experience was. We are planning to be in the city for a week and have talked about staying at two different Riads during that time to have a better variety. 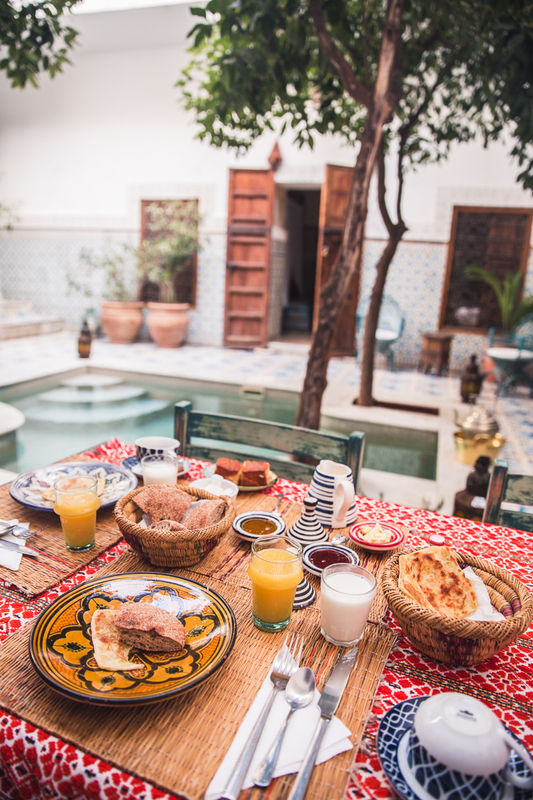 Did you find Riad Yamina accommodations to be nice? Also, do they have a roof terrace? And my second question, when you visited Hotel Mamounia were you able to easily wander the grounds even without being overnight guests? It seems as if you were able to access the most of the hotel (such as the pool area). Is the hotel staff ok with daytime visitors? Hi Rebecca! Sounds like the perfect birthday. 🙂 We really enjoyed Riad Yamina, the owners were so friendly and our room was beautiful. If I remember correctly, yes, they did have a roof terrace! We spent most of our time in the courtyard though. At Hotel Mamounia we had no issues exploring the grounds. We originally let them know we were going to have lunch there but ended up eating elsewhere — I don’t think that’s even necessary though. You will need to make sure your legs are covered, they will turn you away if you don’t follow the dress code! The spa area (black/white moroccan hallway) was closed and I just asked the front desk to take a photo. Hope that helps! We ended up booking with Riad Yamina and one other too, seems to be so lovely! Best of both worlds. 😉 enjoy the trip! Thank you for the Naranj recommendation! We went for lunch today and loved everything about it! I’m going to Marrakech this Friday,. 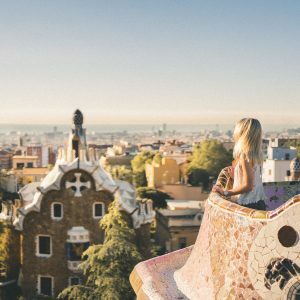 I was looking for inspiration to plan our day in this city and I found your amazing blog. I think I will follow your guide. Just a quick question: is it possible to visit the Mamounia Hotel without being a client? Can we easily go into the hotel and the garden?